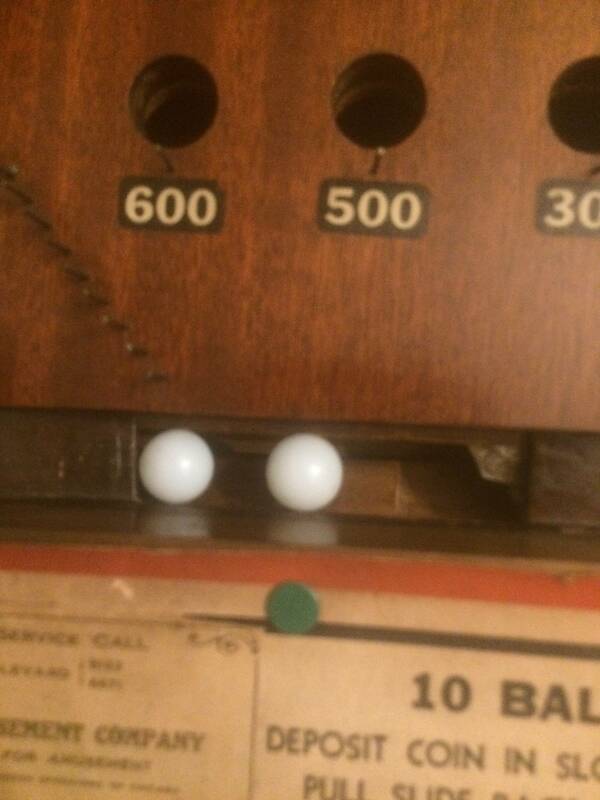 How/is the best way to adjust this sliding play board that goes underneath the playfield of this game? This situation is that when I insert a coin and pushed the coin slide forward, the board underneath that slides up so the balls can drop through doesnt always go far enough forward to allow the balls to drop. I do have the slide pushed as far forward as it will go. Not sure of this will help. How ever, an old trick in getting old wood cabinet drawers to slide easier is to rub bar soap on to the parts of the drawer that slide in the cabinet. Is the channel that the ball release slides in, thoroughly cleaned out? No wood shavings in the way? Has someone blocked the slide by putting a newer nail in the wrong place? Soap sounds like a good lubricant of sorts, although I don't know if it will help. I don't know that it will change the range of motion moving it forward. It moves freely already, it's not hard to push the coin slide/board forward. Nothing appears to be obstructing or limiting movement. All parts present appear to most likely be 85 years old. Perhaps the balls have been replaced at some point I guess is a possibility- they are what feels and looks like glass. And if there is a mod who could add this game to the database, I can provide pictures of this game. I could be possible that the current balls could be the wrong size? (Just guessing on this). Robin has added games for me, Just ask and give him time to do it. check your coin slide and make sure extends far enough. Check where it pushes on the sliding board. ive had games where the push armature is bent in or the wood has been eaten away. Bend the armature or repair the wood in those cases. I just saw you added this to the database-Thank you. I'll get some pictures up a bit later today.